This blog has moved to a new location with a sleek format. If you have this blog bookmarked or feeding through an RSS feed, note that the new URL is www.presbyterianmission.org/food-faith. Thank you to all those attending this months Food Justice for All Webinar Series. There is one more webinar that will focus on SNAP/food stamp outreach and Summer Food Service Programs. Below you can find resources, video, and answers to frequently asked questions from the Webinar series. The first Food Justice for All Webinar was recorded and can be found here. It is 67MB and can be viewed with Windows Media Player (WMP can also be downloaded onto a Mac). Find Answers to Frequently Asked Questions here! Thanks to the Ecumenical Ministries of Oregon for their work writing and publishing this valuable guide. This is a slightly updated version. 2) See also the US Dept. of Agriculture's Faith-Based and Neighborhood Partnerships website for their helpful tools to start community gardens, summer feeding programs, and Food Stamp outreach projects. 3) Make a commitment to end hunger, obesity, and food insecurity by becoming a "Lets Move" congregation today! If you remember back to the last farm bill reform activities, you may even remember Daryll Ray and his analysis around subsidies. Well, myths around subsidies being the root of all evil in the farming system persist even among groups such as Bread for the World. Granted the issue can seem complex and it's easier to mimic what others say (I certainly confess to this sin), but Professor Ray has done a great job of explaining the real story. Thanks to Presbyterian farmer and advisor, Brad Wilson, we have resources on this topic below at the tip of your fingers. Thank you Brad! And if you wish to learn from and join with Presbyterians discussing (and acting on!) similar topics, such as how folks are overhauling the food system with local and regional faith-based initiatives, you are welcome to join the PCUSA Food and Faith Groupsite. Just sign up to join and you'll soon be part of this growing group of Awesome Agrarian Allies! Daryll Ray of the Agricultural Policy Analysis Center at the University of Tennessee has written many excellent materials on the farm bill, price floors, (“price supports,”) farm subsidies, supply management, and related topics. For more detail you can then read relevant sections (or all) of the full report. The accompanying presentation (about 35 slides, ppt/pdf) is also very helpful. Ray has written nearly a dozen years worth of weekly policy columns on farm bill issues, (1-2 pages each) plus an “Archived Series” of earlier columns. I’ve selected and linked some of the key columns in two of my content boxes at zspace . Scroll down to “Farm Bill Primer” and also “Food Crisis Primer,” (which is also about the farm bill). Look for “APAC” in the links to find the materials from Daryll Ray. There are also many other excellent materials there, by the other leading farm bill justice advocates (ie. The Institute for Agriculture and Trade Policy, Food and Water Watch, Tim Wise of the Global Development and Environment program at Tufts University). There is also a list of my blogs (“Most Recent Content,” etc.,) which specifically fill in some of the missing pieces, and address food movement issues. Legislative proposals to address these concerns include the Food from Family Farms Act of the National Family Farm Coalition, (and see a series of 3 short videos of earlier proposals starting here,) the Harkin-Gephardt Farm Bill of the 1980s and 1990s, (see a 1980s video slide show here) and Daryll Ray’s proposal in the report cited above (p. 43+ of the report; Ray discusses price supports on pp. 16, 44, 46, etc. of the report, but not much in his columns). Let us know what you think about any of this, for example, by commenting on this. Ask any of my housemates, my favorite greek word is σκανδαλιζομαι! With lots of exclamation points at the end. “Scandalizomai” – I am scandalized (by whatever gross or otherwise inappropriate thing has just been said)!!! The Greek word has the sense of “scandal” in the sense of something offensive. But it also has the very concrete meaning of something which causes others to trip and fall. A “stumbling block,” if you will. My housemates don’t necessarily feel hurt if I say I’m scandalized by them – Jesus was scandalous too (1 Cor 1:23) – and still is a stumbling block to many. Food is a scandalous subject, laden with cultural assumptions. Any new vegan who has gone home at Christmas knows this. What, Grandma’s roast isn’t good enough for you? Whattayawant, anyway? It goes the other way, too – try asking for a burger in a vegan household. We are scandalized by one another’s choice in food. In a great passage of 1 Corinthians 8, Paul talks about food choices. The choice, in those days, was whether to eat meat (slaughtered in pagan temples) or to be vegetarian (hence not touching idol-tainted meat). My anti-vegetarian friends love to quote this one because it says “those whose conscience is weak eat only vegetables.” Paul was NOT putting us vegetarians down, though. His point is that those who are fully convinced that there is no such thing as a god other than God will not be upset by eating pagan meat. Paul is in that category. He has no moral qualms about meat. However, he is VERY careful not to scandalize his friends. Hence, as to the eating of food offered to idols, we know that “no idol in the world really exists,” and that “there is no God but one.”… It is not everyone, however, who has this knowledge. Since some have become so accustomed to idols until now, they still think of the food they eat as food offered to an idol; and their conscience, being weak, is defiled. “Food will not bring us close to God.” We are no worse off if we do not eat, and no better off if we do. But take care that this liberty of yours does not somehow become a stumbling block to the weak. For if others see you, who possess knowledge, eating in the temple of an idol, might they not, since their conscience is weak, be encouraged to the point of eating food sacrificed to idols? So by your knowledge those weak believers for whom Christ died are destroyed. But when you thus sin against members of your family, and wound their conscience when it is weak, you sin against Christ. Therefore, if food is a cause of their falling, I will never eat meat, so that I may not cause one of them to fall. To me, another question comes up. What about the members of our family who are workers in meatpacking plants? 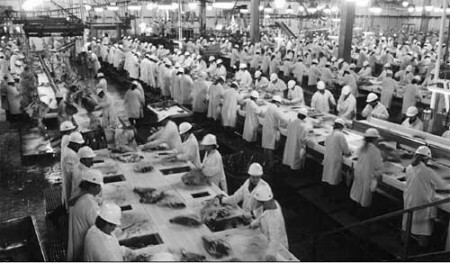 Meatpacking is one of the most dangerous jobs around, due to the speed of the line and the risk of disease. Or what about the members of our family who pick pesticide-laden crops, day after day? Would they be scandalized if they saw us carelessly eating the cheap burgers and strawberries for which they labor? If they saw us preaching “we are all one in the family of God” on Sunday, and saying “$2/pint is way too much for strawberries” on Monday? If we sin against these brothers and sisters, we sin against Christ. Next time you complain about the price of food, think about the brother or sister (for whom Christ also died) who grew, harvested, processed, or served you the food. If they food should be cheap - are they worthless too? What does your theology say? What does your budget say? "God's Earth: Too Big to Fail? An Eco-Justice Conversation Among Faith, Science and Culture"
August 31 - September 3, 2011, at Highlands Presbyterian Camp and Retreat Center in the mountains of Colorado. Keynote speakers include Dr. William Brown, author of The Seven Pillars of Creation: The Bible, Science and the Ecology of Wonder; Dr. Marcia Ishii-Eiteman, senior scientist and director of sustainable foods at the Pesticide Action Network; Carol Raffenspurger, Executive Director of the Science and Environmental Health Network; Dr. Hayes, Professor with expertise in amphibian biology at the University of California Berkley; Dr. Holmes Rolston III, environmental ethics scholar; Dr. John E. Ikerd, professor emeritus of agricultural economics at the University of Missouri Columbia. Special thanks to our conference sponsors, including Environmental Ministries, the Presbytery of Olympia, the Presbytery of the Inland Northwest, Second Presbyterian of Little Rock, and Second Presbyterian Church Indianapolis. Idealism gets a bad rap. A bunch of us well-meaning community gardeners and other such rabble were on a Presbyterian Hunger Program webinar recently, talking about the Manna Economy, and the desert experience which taught Israel how to eat. In this economy, and in stark contrast to Egypt, food is gathered locally rather than stored in huge silos, each family has what they need, no more, no less, and there is no way to exploit another by stealing their food. You can only eat what comes down from the sky each day. You get your food from the hand of God. Beautiful stuff. But it's idealistic, so we shove it aside. 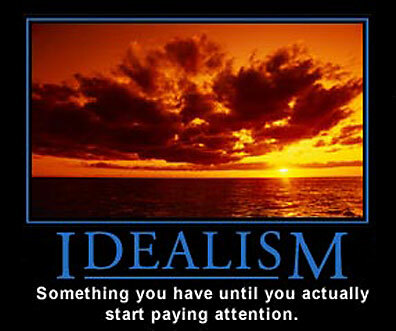 No one wants to be called idealistic. A fate worse than rotten tomatoes. Pie in the sky dreamers? No thanks. We want to be realists, grounded in cruel, cold, reality, because it will make us strong and Correct. BUT GUESS WHAT. THE BIBLE IS IDEALISTIC. At the end of every seven years you must cancel debts. This is how it is to be done: Every creditor shall cancel any loan they have made to a fellow Israelite. They shall not require payment from anyone among their own people, because the LORD’s time for canceling debts has been proclaimed. You may require payment from a foreigner, but you must cancel any debt your fellow Israelite owes you. However, there need be no poor people among you, for in the land the LORD your God is giving you to possess as your inheritance, he will richly bless you, if only you fully obey the LORD your God and are careful to follow all these commands I am giving you today. I will contend that God, too, MUST be idealistic - if she's rash enough to say something like "no one should have to be poor." Hear that? Bible says. No one should have to be poor. If you follow God's ways, even that ridiculous idea of "canceling all debt" every seven years, each of you will be protected from falling into desperation. If you eat what falls out of the sky into your outstretched hands each day, and remember the rhythms of Sabbath, you will not go hungry. If you use the land gently, remembering who your divine Landlord is, you will not face deprivation. Be ye idealistic. Believe that God has a positive vision for this world, where no one is poor. Take part in building that world. Allow God's gentle grace in, to take the place of that cruel and cold "realism." What is really real is in God, and God is an idealist - hallelujah for that! Could this be a growing trend? Will Americans become as passionate about seedlings and goat weed whackers as they currently are about football?! Paul Quinn College Turns Football Stadium into Farm Paul Quinn College (TX) recently planted the first seeds in a former football field that will now serve the college as a student-run, two-acre urban farm. After grocers told the college's president that they didn't want to invest in the underserved Dallas neighborhood where the college is located, he contacted the Sustainable Food Project at Yale University (CT) for a crash course on organic agriculture and educational programs that emphasize the importance of local, healthy food. Part of the harvest will be sold to the company that runs concessions at Cowboys Stadium and the other will be donated nonprofit groups that feed the hungry. By fall the college plans to create a farmers market on its outdoor recreational basketball courts and eventually open its own grocery store. Students at the University of Maryland have contracted goats to combat weeds in a proposed garden area near the School of Public Health. More than 30 goats grazed for three days, clearing the way for fruit and vegetable growing. Also aimed at bringing attention to the new garden, the $1,300 initiative was funded by an Office of Sustainability grant from mandatory student sustainability fees. Send brief cover letter and resume to andrew.kangbartlett (@ sign) pcusa (dot) org by 5:00 pm on Thursday, May 12. Must be available for interview (phone or in-person) on May 13 or the morning of May 16. Questions – call Andrew at (502) 569-5388. The “Land and Food Sovereignty” Study Session, sponsored by Agricultural Missions, Inc., is part of a National Rural Gathering on Land, Water, Energy and Food, together with the Rural Coalition and other allies. Lodging: There are four hotels (from $50 to $75 per night with two beds) all adjacent to the Shawnee venue where Study Session meetings and Ag Missions board meeting will be taking place. Cost: Conference Fees: $250 per person to AMI, includes all meals and local transportation and conference meeting rooms, etc…, and also supports AMI partner participation. A $25 or $50 hotel room deposit is also requested on the attached form, plus the $20 shuttle fee to and from Shawnee (from Oklahoma City airport). To reserve hotel rooms, email or fax hotel registration form to the Rural Coalition, with a copy to Doris, as indicated on form. If you wish to be considered for a conference scholarship (sliding scale) in conjunction with your own fund raising efforts, please fill out attached scholarship request form. See also the downloadable Rural Coalition announcement brochure that includes the latest outline of the schedule of activities during the entire four day event. If you have any questions please email or call Stephen Bartlett sbartlett@ag-missions.org 502 896 9171 or Doris Rivera drivera@ag-missions.org at the NYC office: 212 870 2553. All people have the right to decide what they eat and to ensure that food in their community is healthy and accessible for everyone. This is the basic principle behind food sovereignty. If you want to support domestic food security through the production of healthy food at a fair price, and you believe that family farmers and fishers should have the first right to local and regional markets, then food sovereignty is for you. Connecting food and faith . . .
What are the connections of food sovereignty to our faith values? To our commitment to end hunger? Read Turning the Tables: People First and The Daily Bread by two theologians from Brazil for their reflections on these questions. Learn more about food sovereignty and consider organizational membership in the US Food Sovereignty Alliance. Congregations may join too! Click here to go the USFSA website. On Sunday morning, May 1st, I was working in the church garden with the kids during worship. Like many churches, we send the kids out to Sunday School after the Children’s Sermon, and then come running back in for communion on the weeks when it is served. My hands were muddy from scooping holes into the ground for the tomato plants and I did not pause to wash them on my way back into the sanctuary. We’re trying to do a little Creation-Care as well as Feed-The-Hungry learning in the garden but quite frankly, that morning, the nearby swing set, not to mention the super cool hillside of mulch had more attraction power then the tomatoes & peppers part. Although harvesting, and eating the peas did pull the kids back from tossing the pine cone bombs for a few minutes. I’m thinking the key to Christian Education with this crew will be the ability to talk fast when the windows open up. Also, bribing with food seems promising as well.